There’s no doubt that we love our pies. 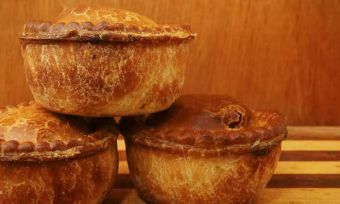 In fact according to the Heart Foundation, New Zealanders consume 70 million pies every year! That’s around 16 pies per person. Yum. “I love a good meat pie, and they’re harder to come by than you think. I’d much rather go an independent bakery or proper pie shop, the filling and pastry is so much better each time. “As a twenty year old I worked in a pie shop in Vancouver called ‘Al a Mode’ (In French this means ‘in the fashion’ but in North America you order pies “Al a mode” and it comes with ice cream). We made some amazing pies each day but my favourite was a turkey and cranberry savoury pie.